About two years ago, Marcin was taken to Florida Hospital in very critical condition — diagnosis: liver failure. The only hope for survival was an immediate liver transplant. Marcin’s MELD score (the standard scale to measure end-stage liver failure) rapidly climbed. Within just a few days it reached 33 (on a scale of 40), and Marcin was placed on the active transplant waiting list. His veins were bursting, he was losing blood and fell into a coma. 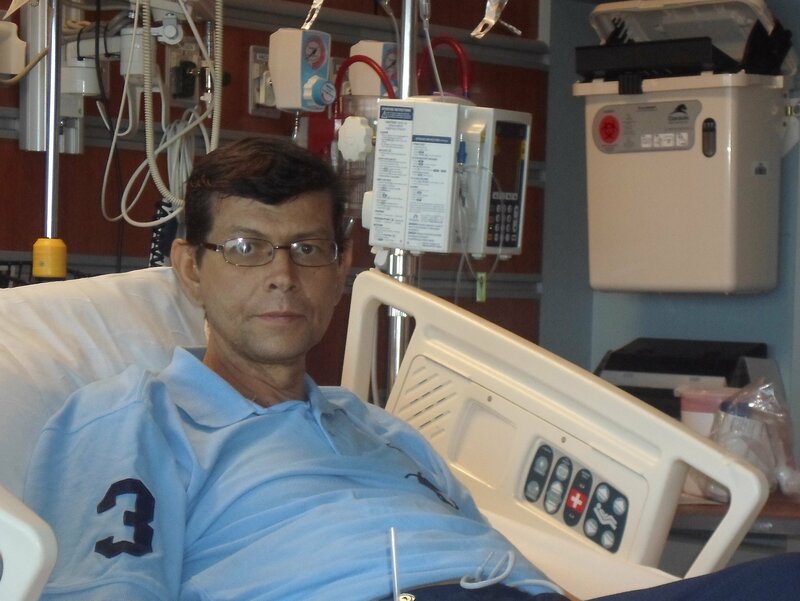 On May 24, 2013 Marcin received his gift-of-life – his liver transplant. Just when we thought he was finally on his way to recovery, his condition again worsened and he was taken into surgery. This time the diagnosis was arterial thrombosis and we were told that Marcin would need a second liver transplant! After many painful days, many hospital visits, many prayers and tears, finally on March 6, 2014 Marcin received his second liver transplant. We won the deadly race against time, but soon after Marcin developed an infection. Aggressive antibiotic treatment was the only option, with a very scary consequence: kidney malfunction. Since his transplant in March, Marcin stayed in the hospital a few more times. His liver and now also his kidney functions have to be closely monitored. In November, 2014 Marcin underwent hernia surgery. Next year he is scheduled for a cataract surgery. Despite all these medical obstacles, Marcin tries as much as possible to stay strong and positive and he is looking forward to his future. As you can see the long journey for Marcin, his wife Renata and daughter Michelle has not ended yet. Not only is a transplant a major surgical procedure, but it is very expensive. Even with insurance, Marcin will have many uninsured-transplant expenses such as: co-pays and deductibles, doctor visits, and the costly immunosuppressant medications that he will need to take for the rest of his life. Fundraising is especially important at this time due to the fact that Marcin lost his construction job as a project manager and state certified roofing contractor when he became ill. In order to ease this financial burden, a fundraising campaign in Marcin’s honor has been established with HelpHOPELive, a nonprofit organization that has been assisting the transplant community for more than 30 years. All donations are tax-deductable, are held by HelpHOPELive in the Southeast Liver Transplant Fund, and are administered by HelpHOPELive for transplant-related expenses only. If you wish to help Marcin, then please click the DONATE NOW button. Marcin and Renata, you are in our thoughts each and every day. May you be surrounded with better health, positive energy, the smiles and kindness of others, and your love for each other. A huge family hug from all of us to all of you. Always with you. Grant, Margot, Craig and Ian. Be strong Marcin! We are keeping you and your family in our prayers. Witaj Marcin.Szybkiego powrotu do zdrowia zyczymy.Modlitwa I myslami jestesmy z Toba. My prayers for your fast recovery.Be strong ,We are thinking about all of you . Hey Marcin! I haven't seen you in a long time, but please know that you and your family are in my thoughts and prayers. Marcin nie poddawaj sie, musisz walczyc bo masz dla kogo! pamietaj jestesmy z toba!